Have you seen my college classroom website yet? Here's the front page. 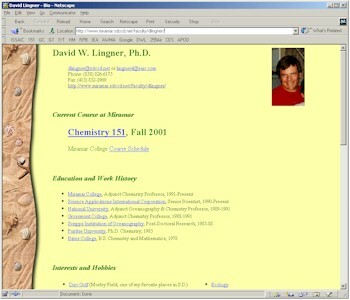 If you click on "Chemistry 151," you'll get to my current class. This is an introductory chemistry class for chemistry and science majors. It's not exactly the "General Chemistry" class that I took in college. Nowadays, students have to take my class first. My main mission is to get the students comfortable with chemical calculations and give them a good idea of chemical theory and nomenclature. I like to think that they are very well-prepared for General Chemistry when they leave my class.